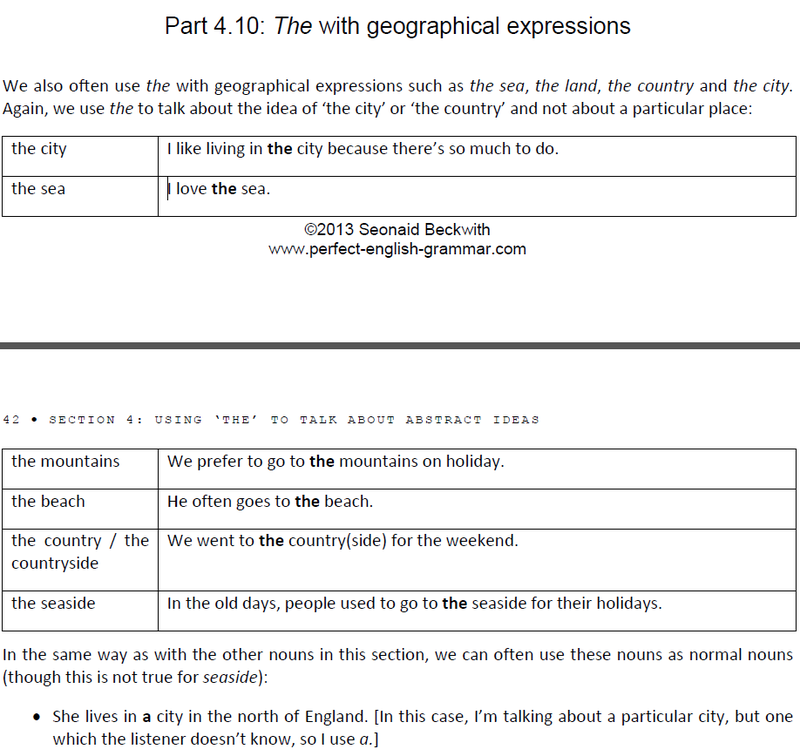 I know in English you can use the definite article with geographical expressiones such as the sea, the country, the land, the city, the beach, the seaside, but what about other geographical terms? Can I use them as generic terms to mean "the idea of ..."? I don't mean any particular place. The jellyfish lives in the water. The grasshopper lives in the meadow. Is there a cat that lives in the desert? There is only one type of cat that lives in the desert. The sand cat (Felis margarita) is the only member of the cat family tied directly to sand regions. Found in North Africa, the Arabian peninsula and the deserts of Turkmenistan in Uzbekistan, the sand cat has adapted to extremely arid desert areas. Plants live in many different environments. Some live in the ocean, some live in the desert. Plants are very important to everyone on the planet. Hope shows up in several places in this very dark world—such as in the incorruptible goodness of Katniss' sister, Primrose. It shows in Katniss' rare sacrifice for her sister, when she volunteers to take Prim's place in the Games. It lives in the meadow and the woods, where the natural world exists mostly unmolested by the powerful central government. Wow, I thought this would be easy, but it's actually a little tricky. I think the answer to your question is "It's all over the map." Consider your first sentence, "The jellyfish lives in the water." It would sound much better if you said "The jellyfish lives in the sea." (Since there are many different kinds of jellyfish, it might sound even better like this: "Jellyfish live in the sea." Your next sentence, "The grasshopper lives in the meadow," is more confusing. Actually, grasshoppers live in a wide variety of habitats. But let's pretend they occur primarily in meadows. You would probably want to say "The grasshopper lives in meadows," or "Grasshoppers live in meadows." You could also say "Grasshoppers inhabit meadows" or "Grasshoppers occur in meadows." Unfortunately, I haven't given you a really good rule of thumb. Unless someone else can suggest some rules, you'll just have to take it on a case by case basis. In other words, each sentence may be unique. "Can I use them as generic terms to mean 'the idea of ...'?" If you really mean to speak conceptually, as in poetry or very abstract terms of science, yes you could say "The jellyfish lives in the water" or "The grasshopper lives in the meadow." It will read better though to remove one of the articles from the sentence and change the verb to match. So either "Jellyfish live in the water" or "The jellyfish lives in water." Similarly but a little different one could say "Grasshoppers live in the meadow" or "The grasshopper lives in meadows" or perhaps just "The grasshopper lives in a meadow." Depends on what you are trying to say. Not the answer you're looking for? Browse other questions tagged grammar definite-articles geography or ask your own question.